If you are the kind of person who can always find an excuse not to exercise, organized classes might suit you best. Having others ready to drag you along might also help organize a group from the office to attend classes so you can�t opt out. With its controlled, gentle, and continuous movements, t�ai chi is particularly good if you aren�t as mobile as you once were, since it builds muscle and bone strength without putting pressure on the joints. It benefits the brain and mood by focusing and calming mind and body, and its rebalancing breathing techniques offer insight into how we breathe when we move. Learn with a well-trained teacher. Whatever your stage of life, yoga is the perfect form of exercise for mind and body, and it�s never too late to start. As well as the obvious physical benefits (improving posture, boosting circulation, promoting balance and coordination, strengthening core muscles), yoga helps you stop and focus within, which is both stressbusting and energizing. It sheds light on other areas of life, such as emotions and relationships, that might need work. It also teaches breath-control techniques to calm, focus, and rebalance body and mind. Iyengar yoga is the best starting point if you would like a structured grounding in the poses with close teacher supervision. If you prefer a challenging cardio and strength workout, look for Ashtanga or power yoga, Bikram or hot yoga, or vinyasa classes that teach flowing sequences of poses. To explore the spiritual side of yoga, try Sivananda or Kundalini yoga. Hatha yoga classes often offer a mix of approaches. Yoga may be effective for numerous health conditions, ranging from back pain and depression to carpal tunnel syndrome and arthritis. If you have a health condition, find a yoga therapy teacher who will set out a program of postures and breathing exercises specially tailored to your condition. Pilates classes suit those who don�t enjoy sweaty forms of exercise, people with injuries and those keen to maintain good posture with age. The movements are very low impact you might find them imperceptible at first and focus on strengthening core muscles in the center of the body that support the spine and pelvis. Breathing techniques enhance the moves. Pilates is effective at increasing mobility, developing core strength and flexibility, achieving good body alignment, and helping prevent back problems. It also instils a sense of discipline and understanding of how the body moves, ensuring flowing movement continues as we age. Supportive but resistant, relaxing yet energizing, water is the ideal medium in which to exercise safely the heart and lungs, muscles, and bones. Aim for a 20-minute swim 3�6 times a week. Water exercise is especially beneficial if you have aching joints: buoyant water supports body weight, reducing the strain on vulnerable areas such as knees and hips. 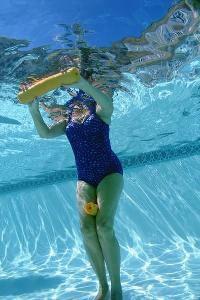 Water resistance makes for effective toning and strengthening, especially of thigh and chest muscles. It also soothes puffy legs as water pressure encourages the movement of fluids back into the bloodstream, reducing swelling. Swimming promotes deep, controlled breathing and studies show that exercising in water boosts the immune system. If you can�t swim confidently but want to share the benefits of exercising supported by water, take a walk in a calm ocean or try an aqua aerobic class in the shallow end of a pool. In studies, women who exercise in water have reduced heart rates and blood pressure compared with those who exercise on land. Walking is not just good for maintaining bone density, it can be as good for the heart as jogging, suggests a small study. Brisk walking, covering 1��2 miles a week, can reduce the risk of developing cardiovascular disease. Aim for this modest distance when you start walking, building on it to gain even more health benefits as fitness and self-confidence increase. All you need for walking outdoors is a pair of walking boots. Walking off road brings extra benefits because as the terrain changes you have to adjust your posture and vary the muscles used, which also stimulates the brain. Warm up with slow strides then speed up gradually, pumping your arms. Once warm, alternate short steps and long strides, tackle inclines, and introduce interval training 10 steps jogging followed by 10 steps walking.